Watching Chinese movies in which people slurp down steaming hot noodles with evident pleasure has made me hanker for Asian food more often than usual. More than once the only recourse has been to eat Ramen noodles, which I had given up many years ago. I won’t lie–I have found them scrumptious! 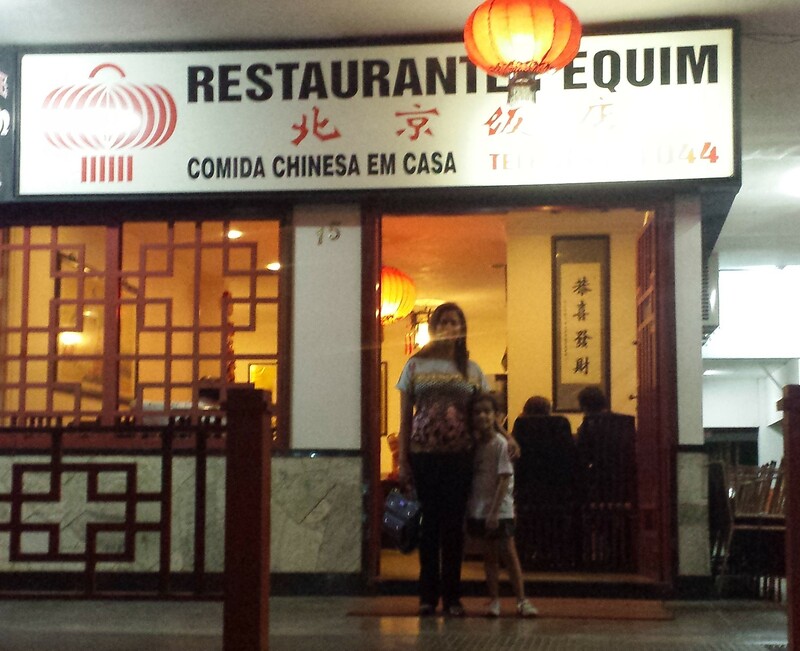 Last week, after watching A Touch of Sin, I needed noodles again, so I took my wife and daughter to a local Chinese restaurant here in Brasilia. The owner is Sichuanese and was once the cook at the Chinese Embassy. As we were finishing our meal, he sat at another table to have dinner with his family, including a small boy, apparently his grandson. At one point, my daughter handed something to the boy, and his mother said, “shie shie,” or thank you. To everyone’s surprise and delight, Camila Daya responded without the slightest pause or hesitation, “Bu ke chi,” or you’re welcome. Any vestige of embarrassment faded and I was one proud baba! 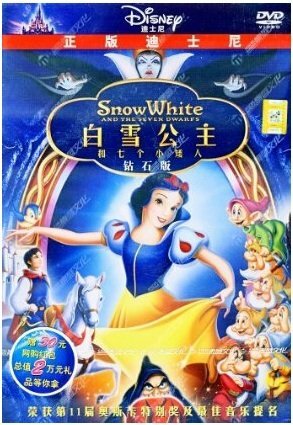 That small experience may have helped motivate her, along with the arrival of some Disney DVDs, to put in a few hours of Mandarin listening after an almost three-month hiatus. We watched The Lion King in Mandarin twice, and Pinocchio once. Her memory is remarkable. 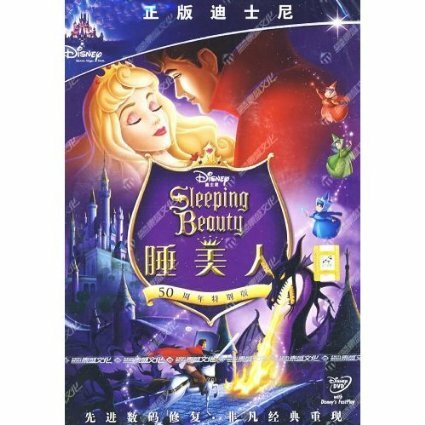 This week I also started listening to the song Nan Zi Han or Make a Man out of You from the movie Mulan again. (One of these days I will really learn it!) She has probably listened to it fewer than half the times that I have, but she remembered the first few lines much faster than I did. Here is our updated Hours of Viewing graph. 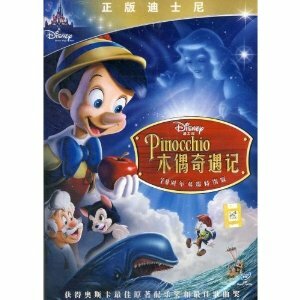 In other news, I also watched my first non-Disney movie dubbed in Mandarin, Casablanca. I watched it without any subtitles. My comprehension was even lower than I had expected. 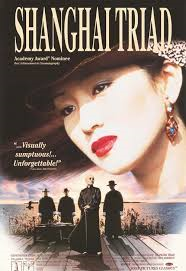 I thought having seen the movie in English before would help me understand many words and phrases, but in fact I did not understand significantly more than I do when watching Chinese films. 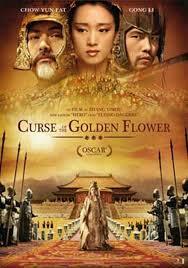 Nonetheless, it is such a great movie and very dialogue-intensive, so I will watch it again. Yesterday I inaugurated a new resource for Mandarin listening and viewing. 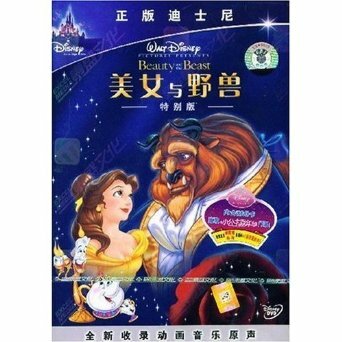 I have planned to use it from the outset: Western children’s movies dubbed in Mandarin—especially, but not limited to, Disney movies. Variety is the spice of learning a language by watching videos. Besides variety, I anticipate one benefit in particular from this new resource: renewed engagement and viewing hours from my six-year-old daughter, Camila Daya. 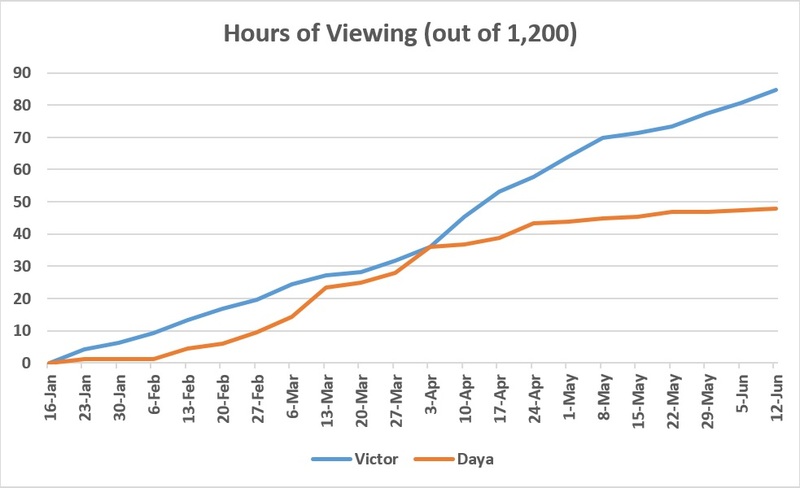 Note from the following graph that from weeks 4 to 12 she not only kept pace but caught up to my viewing hours. This was largely thanks to Boonie Bears, a fun but too difficult source. She even wrote a blog post! 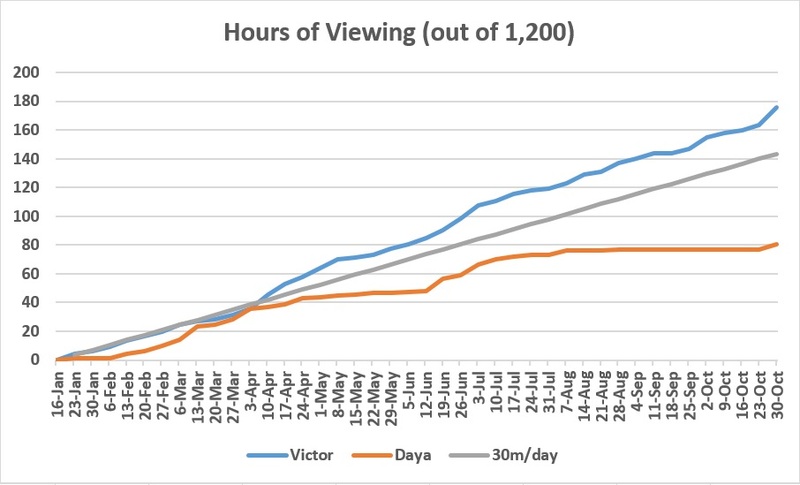 However, her viewing abruptly tapered off, and at present I’m on track to double her total hours viewed. Time will tell, but I think there is a chance her viewing will skyrocket now with these new DVDs, since, like most kids, she has the capacity to watch movies she that she likes over and over again. Interestingly—and this may not be that typical for a six year old—the language does not seem to matter that much. I remember how she got started with Spanish. One day, I believe when she was still four, she said to me, “Dadda, I know how to say ‘Princess Ariel’ in Spanish.” She proceeded to perfectly trill the ‘r,’ precisely produce the closed ‘e’ vowel sound, and hang her tongue at roof of her mouth at the ending ‘l’ sound. I was impressed! “How did you know that?” I asked her. She laughed long and hard before telling me that she had discovered that she could set the DVD to Spanish. Since then, in addition to one-hour Spanish classes once or twice a week, she continues to progress, albeit slowly, by occasionally watching videos in Spanish and access Spanish-learning websites for kids (Mi Mundo en Palabras and Plaza Sésamo). If she continues this project and eventually learns Mandarin, she will become quadrilingual, not to mention knowing a hundred or more ASL signs. I got these DVDs from the US Amazon site and had them shipped to my brother, who lives in Boston and just arrived in Brazil for the World Cup. There are other titles available, and if this goes well, I’m sure I will get many more. 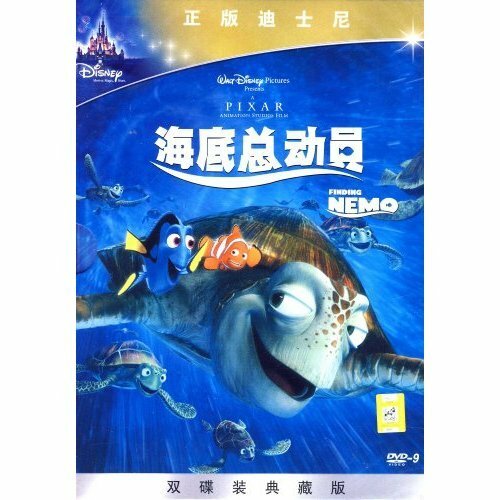 In addition to variety and appeal to Daya, other advantages to this resource may be: familiarity with the plots, simplicity of plots and dialogue, catchy songs that stay in one’s head, high quality and entertainment value (even for adults), and ease of switching audio and subtitles (not the case with the downloaded movies I watch on my tablets). The major disadvantages I can think of are inherent to the fact that these are Western movies. The dialogues are translated, which makes them less authentic and perhaps less rich and valuable, and I will not be getting culture insights, which are closely linked to effective language acquisition. What are your thoughts, dear reader? 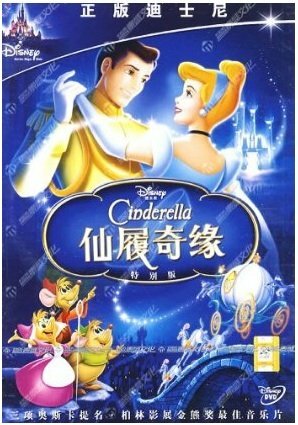 Is this a good addition or not to my Mandarin viewing sources?